Product #20593 | SKU 3I-4213-12BL | 0.0 (no ratings yet) Thanks for your rating! The Injection Moulded Waterproof Case with Wheels and Layered Foam from SKB is made from an injection-moulded high-strength polypropylene copolymer resin that is waterproof, air and dust tight, as well as UV, solvent, impact, corrosion and fungus-resistant. The moulded-in hinge provides additional strength. 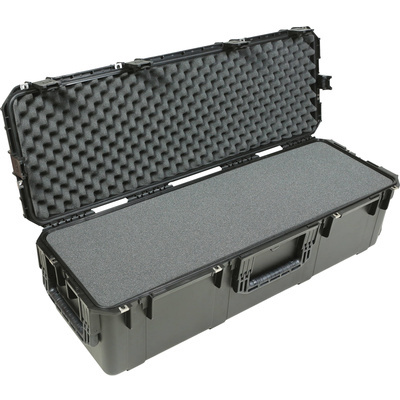 This case is typically used to store, and transport delicate equipment such as cameras, electronics, mics and mixers, cables, or musical equipment. The layered foam can be cut to separate electronics or gear into customised compartments. Access to the interior is via trigger releases that can be retrofitted to accept TSA key locking latches. The padlock holes include stainless steel protector clips. An equalisation relief valve protects your gear against changes in pressure such as when you're on an aeroplane. For portability, there are in-line skate wheels and a snap-down rubber over-moulded cushion grip handle.